To celebrate their success in raising $7,000 for cancer research, Elmwood Franklin School visited the Kiss 98.5 studio to discuss their Bald for Bucks event on-air with DJ Anthony. Which Nichols Student Will Raise the Most Money?? Students from Nichols joined DJ Anthony at the Kiss 98.5 studio to share why they are Goin’ Bald for Bucks on Wednesday, March 9. Lake Shore Central Schools, the home of Bald for Bucks, took over the Kiss 98.5 studio on Wednesday, March 2 to discuss their upcoming Bald for Bucks event with DJ Anthony. Lake Shore is going under the clippers on Friday, March 11. Transit Middle is Goin' Bald! First In-Studio at Kiss 98.5 of 2016! 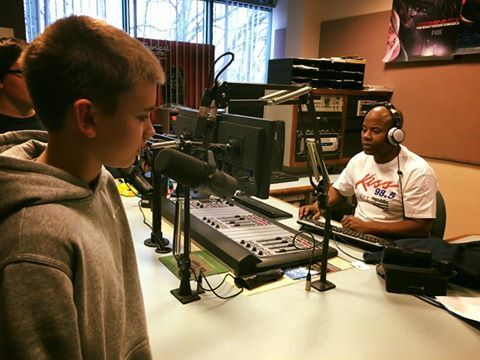 Lancaster High School and Pembroke Central School District were the first schools this year to receive an exclusive tour and interview with DJ Anthony at the Kiss 98.5 studio! In-Studio at Kiss 98.5: West Seneca West Challenges You to Go Bald! On Wednesday, March 18, a group of girls from Orchard Park High School took over the Kiss 98.5 studio to discuss their upcoming Goin' Bald for Bucks event.